We typically do these Action Point posts after we play historical Wargames to share insight into the gameplay and provide examples of key moments from our games. We usually use a newspaper headline generator to create a fake historic headline summarizing a certain event in the context of the time period the game is covering such as World War II while playing Churchill. But we had trouble finding an online scroll generator and there weren’t many newspapers in 400BC! So with that introduction, this Action Point is from our first play of Pericles: The Peloponnesian Wars by GMT Games. In Pericles, players control one of several factions amongst the Athenians and the Spartans. 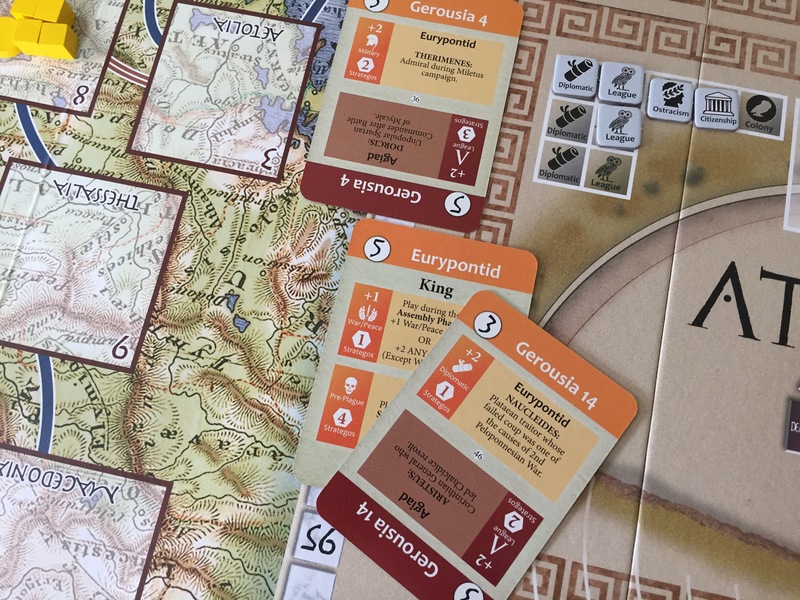 In a 2-player game, each player controls one faction from both the Athenians (either the Aristicrats or Demogauge) and the Spartans (either the Agiad or Eurypontid). In our game I was the Aristocrats and Eurypontid. The game consists of a political struggle over various issues that affect the way the Peloponnesian War is conducted. The Political phase is played out in the Assembly while War is then raged in the Theaters and is directed by the placement of issues by each side in various boxes representing locations in the Aegean Sea and Greece. In our game during the Assembly phase, I wanted very badly to win the League Issue in the Spartan Assembly as I had designs to build some bases to establish my influence. 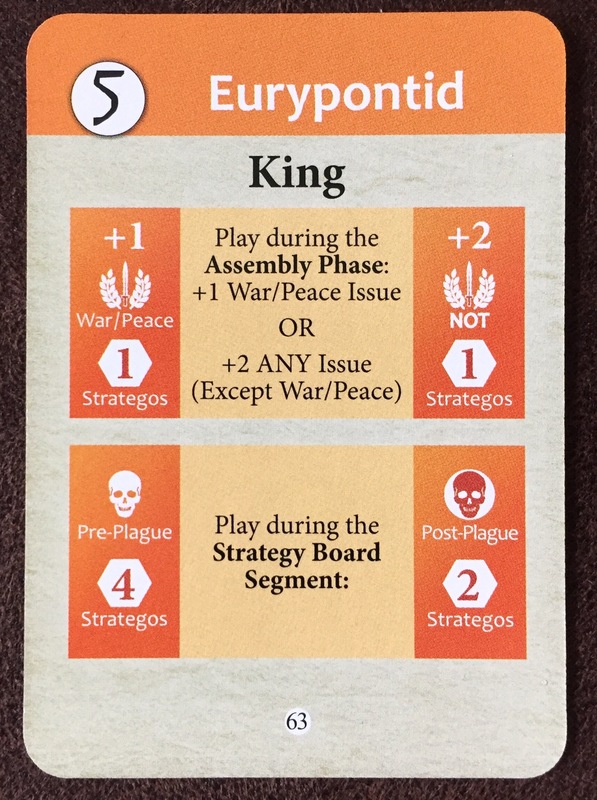 When it was time to debate the League issue I decided to play my King Eurypontid card, which with its special ability would give me a total of a 7 (card value was a 5 with a +2 bonus on any issue if not War/Peace). As I thought about this, I didn’t feel 7 was enough to get the issue far enough onto my track so I also decided to use my Brain Trust ability, which when playing my faction Leader and the opponent does not, I can randomly discard a card from my Entourage to add that cards value to my total. This ability is a neat mechanic as when each player received their initial 9 cards they had to choose three cards to put in this Entourage for potential use as a Brain Trust. This is kind of a blind draw as when making the Entourage you don’t yet know what issues are on the table and are simply trying to guess what issues might appear and then choose cards that don’t match those to put in this side deck. So I drew forth a card from the Entourage and it was a 3 bringing my total result to a 10. His card played was a 5 and added a +2 on a League issue for a total of 7. With this result, I won the debate and was able to move the League issue three spaces onto my track as you take the difference in card strengths to determine movement. So for this example, 10 – 7 = 3. I was very glad that I decided to use the Brain Trust as had I not, our scores would have been tied resulting in the issue not moving! This issue could still be debated in the future but in my limited experience, having it on my 3 space makes it pretty hard to get off of there. This victory was not without cost though as I will be unable to use my Entourage in the next turn let the rules. This is a benefit that should be used sparingly and only for what you deem to be an important issue. Our next Action Point will focus on the results of our first Assembly, including what issues I won and how I planned to use them. You’ve already learned an important political tactic. Great article, great read. As a sidenote – you use the braintrust AFTER you see your opponents card, you don’t have (and actually can’t) decide before.